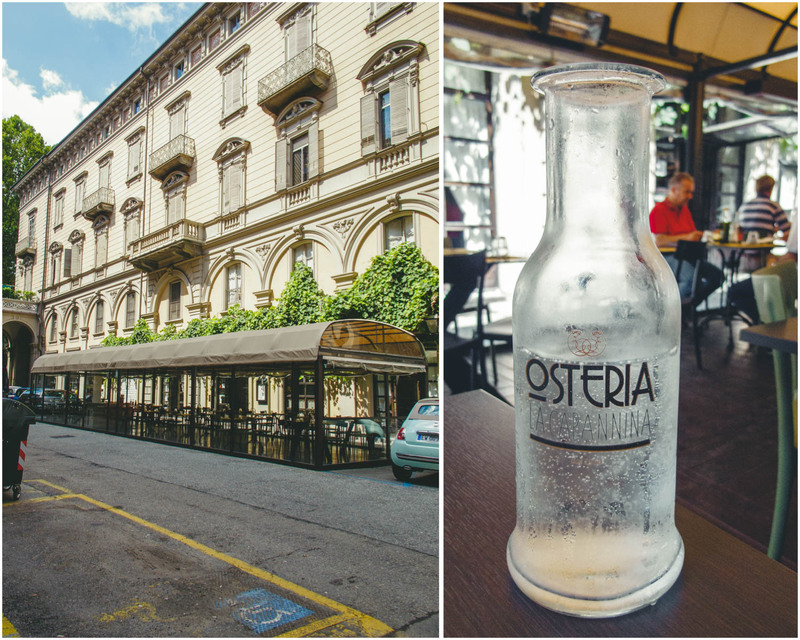 Earlier this summer, we had the pleasure of taking a trip to Turin, Italy. From mid-July until mid-August, we stayed in this lovely city in the heart of Piedmont along the River Po. 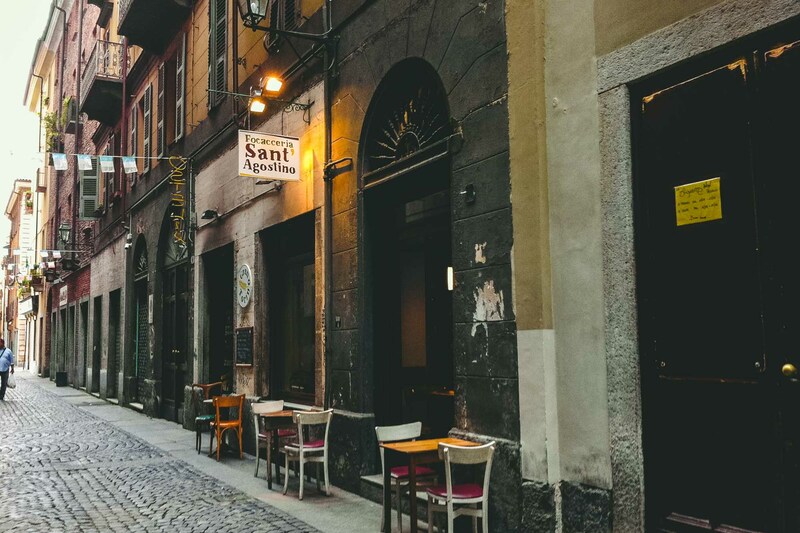 We found our apartment on AirBnb, conveniently located in the center of the city just off of via Garibaldi – the longest and busiest pedestrian street in Turin. For the first time in our experience with AirBnb (get $38 off your first stay), the flat even included breakfast, delivered twice weekly and the best part was the homemade bread! Given the central location and moderate size of the city center, we were able to walk everywhere during our stay. Walking in Turin is aided by the fact that the city has more than 10 miles of covered sidewalks and these arcades form a significant part of the identity of Turin. Turin has a distinctively Northern Italian feel to it but the French influences around Turin also serve as noticeable reminders of the proximity and history this region has with France. In fact, there were occasions when we felt as if Turin had more similarities to places we have been in France, Austria or Germany than, say, Rome. These Northern influences give Turin a sensibility that makes it a comfortable place for an extended stay. An easy place to imagine living. Combined with the wealth of fresh, local ingredients and some of the best wines we have ever tried, it was one of the hardest places for us to leave! 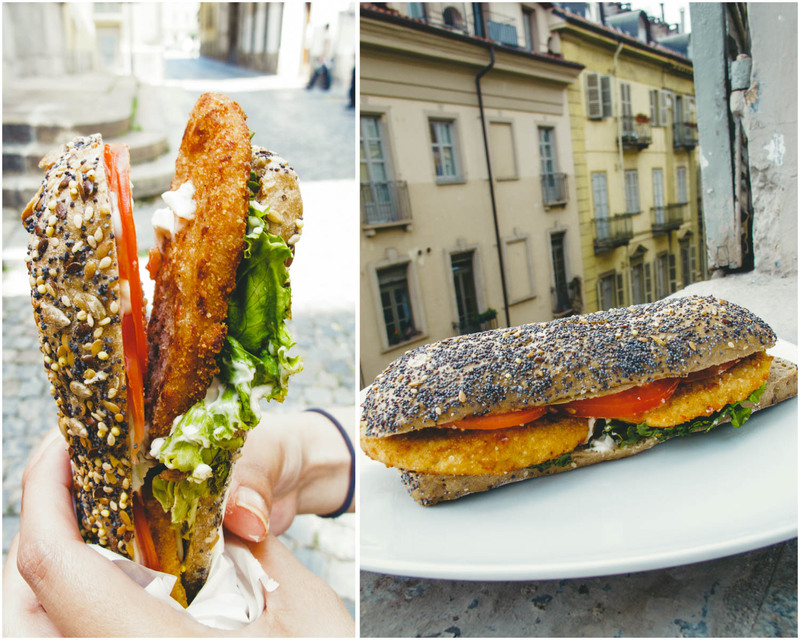 Update (April 2017): Universo Vegano Torino has closed and a new vegan fast food restaurant, La Vispa Teresa, has opened in this location. 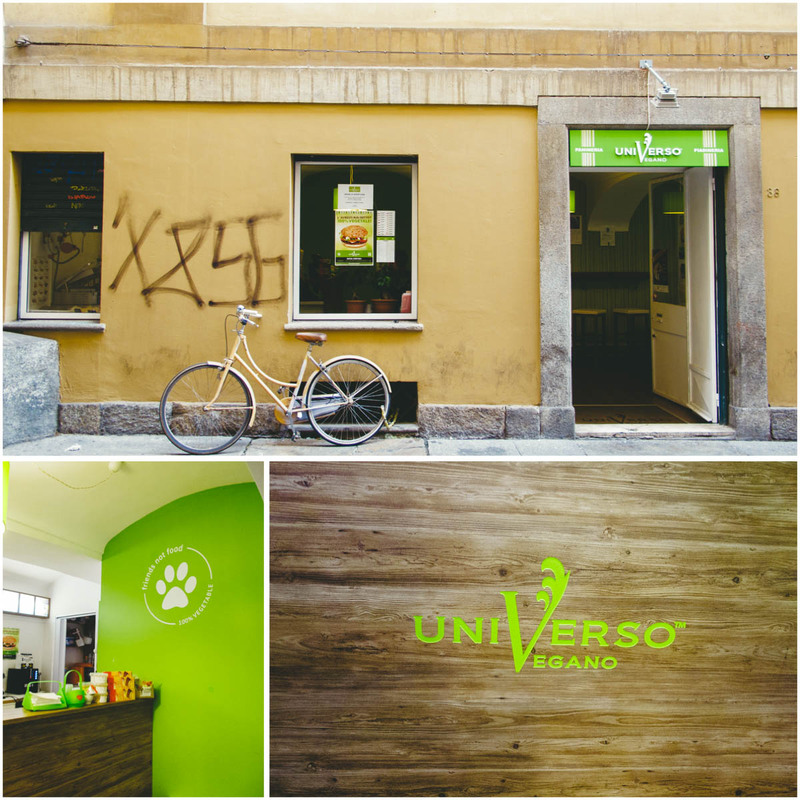 Universo Vegano maintains a number of other locations throughout Italy still. 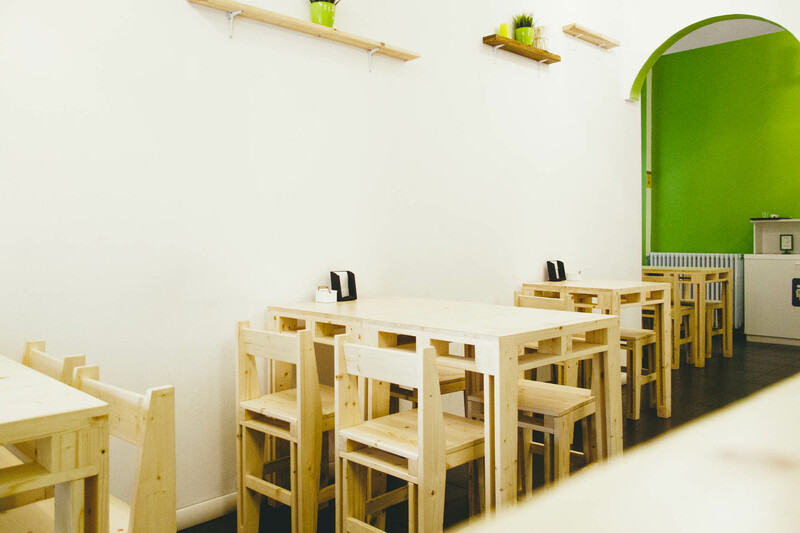 Universo Vegano (pronounced like Ooni-verso Vay-gono) is a relatively new Italian vegan fast food chain, in fact it is the first 100% vegan fast food restaurant chain in Italy with locations in Milan, Verona, Rome, Bergamo and more. 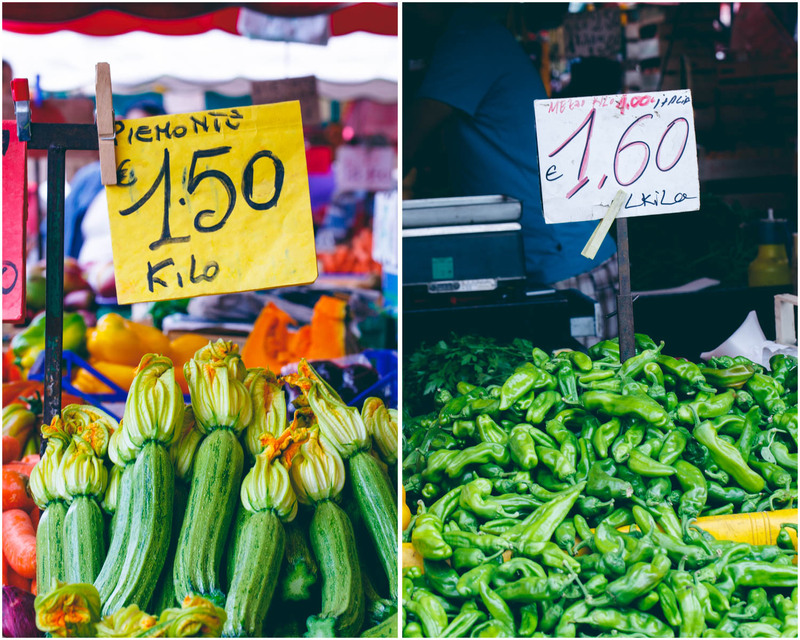 The Turin location was just a short 5-minute walk from our flat and was a small, colorful little place on a quiet cobblestone street in the city center just a block off of via Garibaldi. Around the 1-2 pm lunch hour the place can get pretty busy and the line can be out the door but they are pretty quick with getting orders sent out, go outside of the lunch hour and there is virtually no wait for a quick and tasty bite. View the menu here and here. 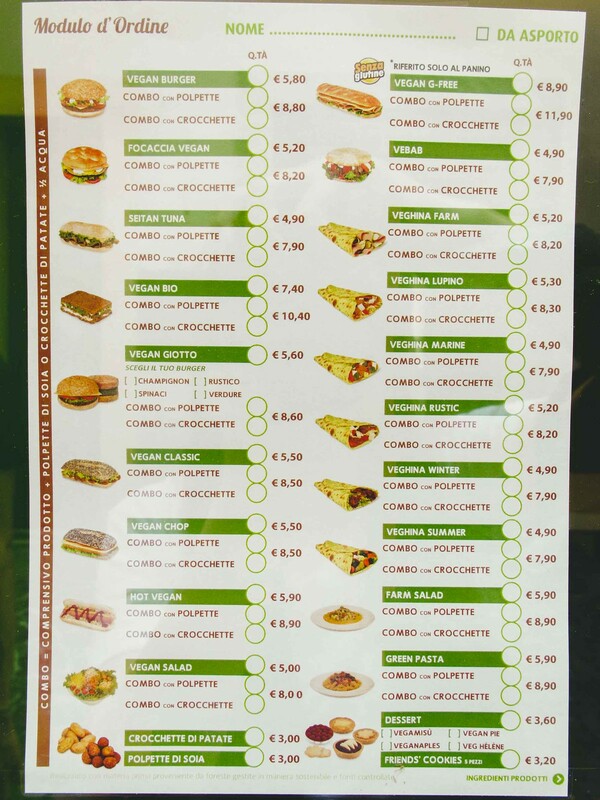 Sandwiches and wraps range in price from €4.90 to €11.90 depending on what you order and whether you order as a meal set (side + still or sparkling water). The gluten-free sandwich is the most expensive option on the menu. We only tried the sandwiches but Universo Vegano also has salads and wraps and in other locations the menu is expanding further to provide pies, soups, pizzas, pastas and more. 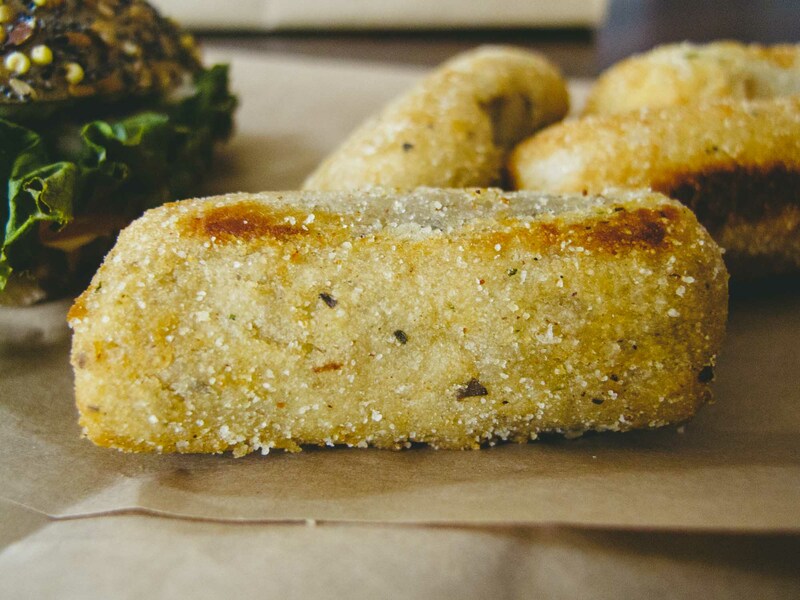 The Vegan Classic Sandwich with Crocchette (Croquette) combo meal comes with either Polpette (Soy Meatballs/nuggets) or Crochette (Croquettes). Four croquettes come with mayo and ketchup but overall the croquettes were too bready for us. The mayo was creamy and a bit sweet but a nice condiment. The Vegan Classic sandwich is a good selection, with deliciously crusty seeded bread, vegan salami, vegan cheese, mayo and lettuce. Along with tasting great it’s also sturdy, not too messy, and easy to eat on the go. I recommend trying their sandwiches, wraps and burger without sides. I would personally prefer french fries or onion rings as a side dish option. Vegan Chop Sandwich included Breaded tofu cutlet, vegan cheese, vegan mayo, lettuce and tomato. I like how thin and crunchy the breaded cutlet was. This sandwich was virtually the same as the Vegan Classic, just with added tomatoes and a different protein. I still prefer the salami slices in the Vegan Classic over the breaded patty in the Vegan Chop though. Vegan Focaccia Sandwich had Veggie ‘omelet’, vegan cheese, lettuce, vegan mayo and tomato. I’m impressed with their use of quality bread, these don’t taste like cheap processed breads and they manage to keep the breads dry enough to hold together but not too dry that they are difficult to eat. The focaccia bread is softer than the seeded bread and a bit oily, as you would expect a focaccia to be. The veggie ‘omelet’ was unique and they called it a ‘frittata.’ The texture was sort of like farinata or polenta. Yet another nearby restaurant with extensive vegan options. 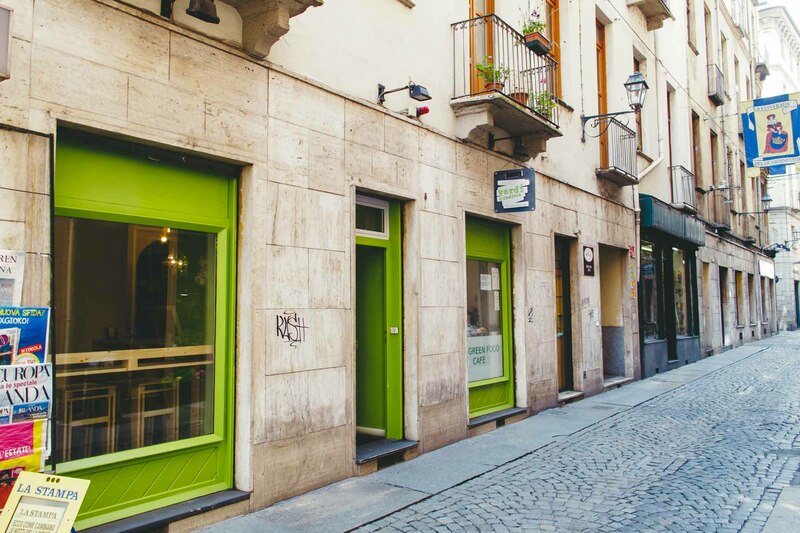 Located on the same street as Universo Vegano and just a 10-minute walk down a quiet little cobblestone street. 100% vegetarian restaurant, mostly vegan, with a daily lunch menu posted both on their front door and on Facebook. They usually post on Facebook before they open, so it’s convenient to be able to check before you head out whether they have anything you want for lunch. 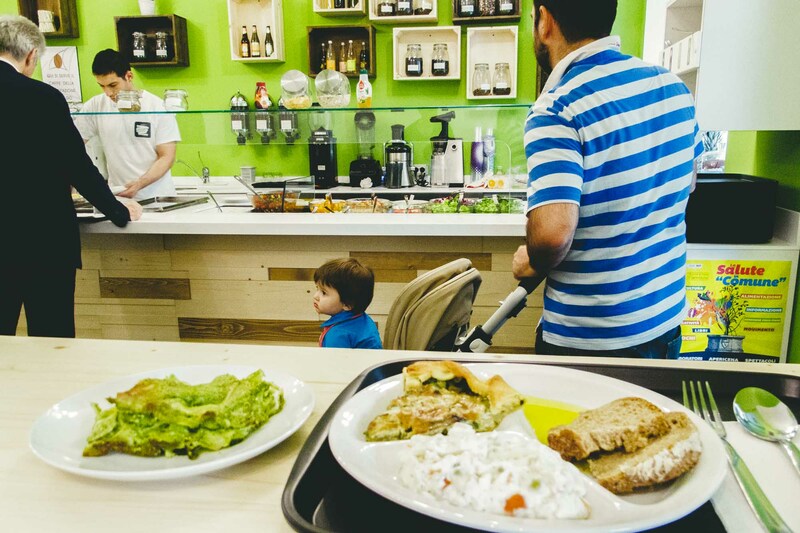 Primarily a lunch place, they also serve coffee, fresh made juices, salads and pastries throughout the day. I highly recommend going for lunch since it’s a great value with a great vibe and delicious food. Lunch consists of three courses. Each course has two options to choose from and you can order any combination of the three courses. The courses are side, (savory) pie and main. 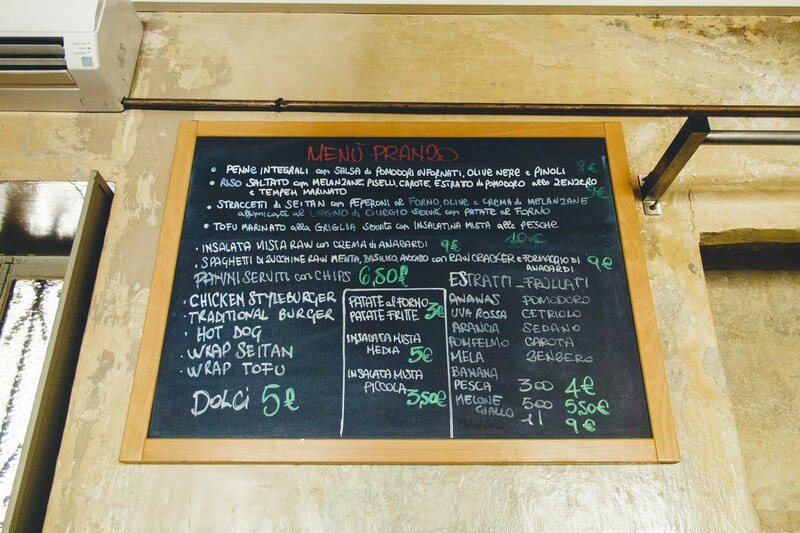 The menu board in the restaurant includes all the different combos available (pie + main, side + main, pie + side) as well as ordering just one course. We ordered the 3-course menu and it was only €6.50. Bottled water is an additional €1 and coffee is an additional €1.50. 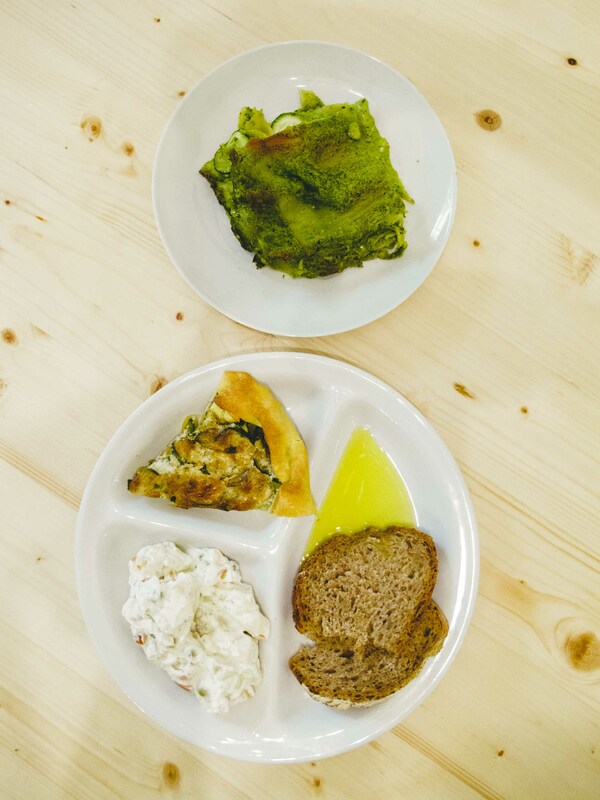 €6.50 3-course menu: Vegan arugula-pesto lasagna, Russian potato salad and savory pie (courgette, fennel, soya cream). Main: Lasagna Verde con il Pesto di Rucola VEGAN (Arugula Pesto Lasagna) Very thin lasagna sheets, with courgette rounds and a peppery pesto. Doni loved this one because it was a little creamy and the arugula pesto had a lot of flavor. Salad: Insalata Russa VEGAN con Seitan: It was a creamy ‘potato’ salad with cubed seitan, peas, cucumber, etc. I would get it again and would love to make my own sometime. Tart: Torta Salata VEGAN con Finocchi Zucchine e Panna di Soia: My favorite savory pie slice with courgette, fennel, soya cream. 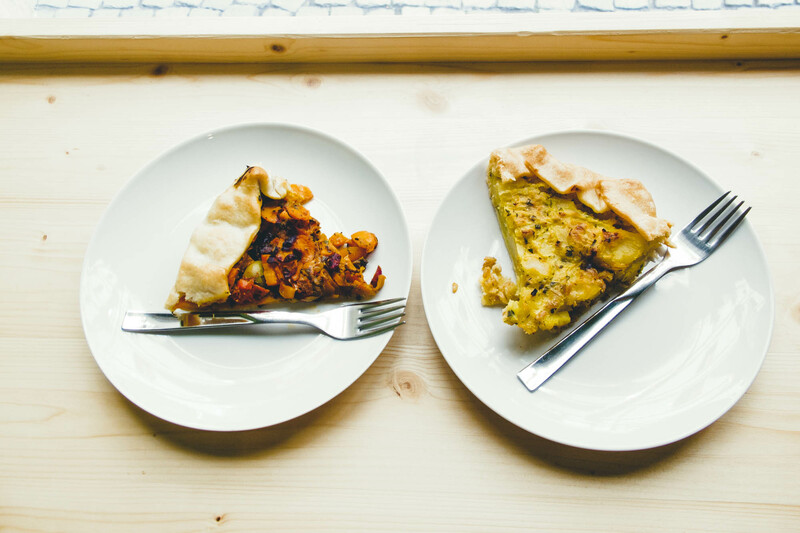 All their savory pies are served on a delightfully flaky and slightly rich crust. 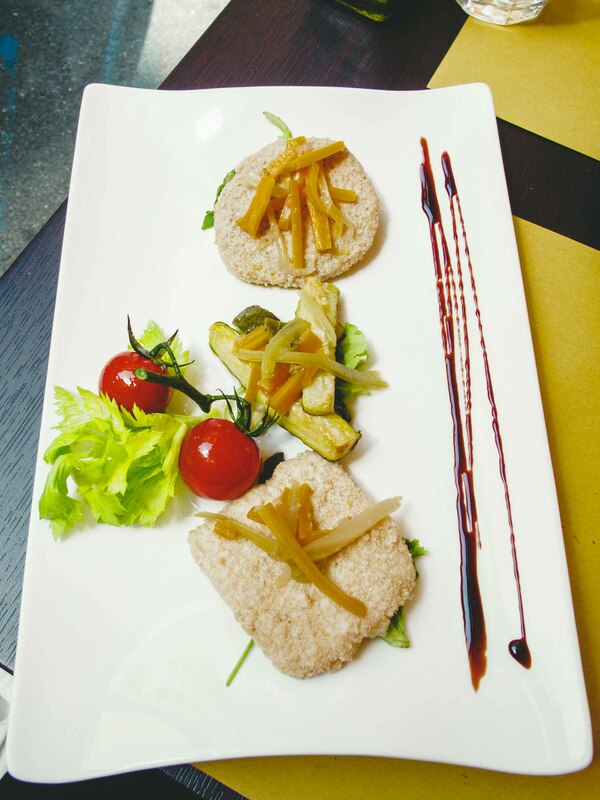 We tried another €6.50 3-course menu on another day: vegan eggplant ‘parmesan’, savory muffin and potato-onion-farro pie. On another visit to Verdi D’Indivia we tried two more of their pies, Eggplant-Carrot-Olive-Beans and Potato-Onion-Farro. 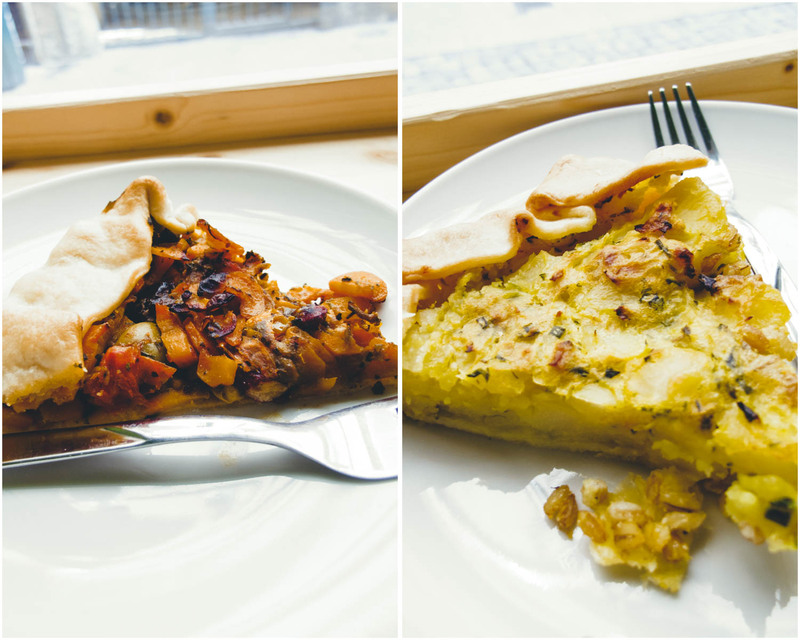 The Potato-Onion-Farro pie was the better of the two since it was a bit more substantial. We contacted them initially about their menu, but the owner said they did not like to share it online. I was disappointed since we were undecided between going for lunch or dinner and seeing the menu in advance would have helped us decide. We eventually just went for lunch since it was more convenient. 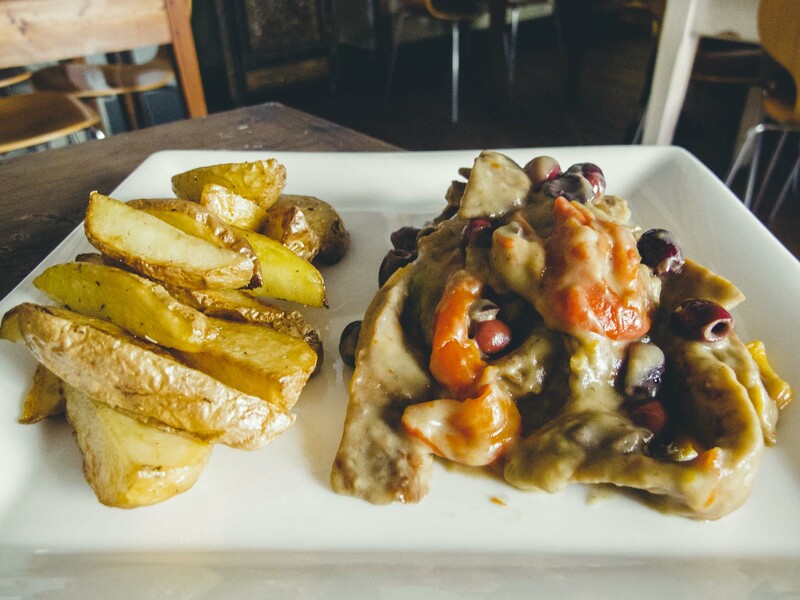 The lunch menu was comprised of a few standard Italian vegan lunch items (a pasta dish and a rice dish) along with a couple of raw options, some salads and American style comfort food. A few lunch items change regularly (not daily), typically the rice and pasta dishes will change. They have a dinner menu, but the owner and staff recommend a reservation for dinner and they tend to be booked up in advance. Dinner prices are noticeably higher, but maybe more creative than their lunch menu. We went when it opened at 12.30pm. By the time we received our meals, close to 1pm, the restaurant was already quite full. We ordered two meals and two drinks – total €24.50. 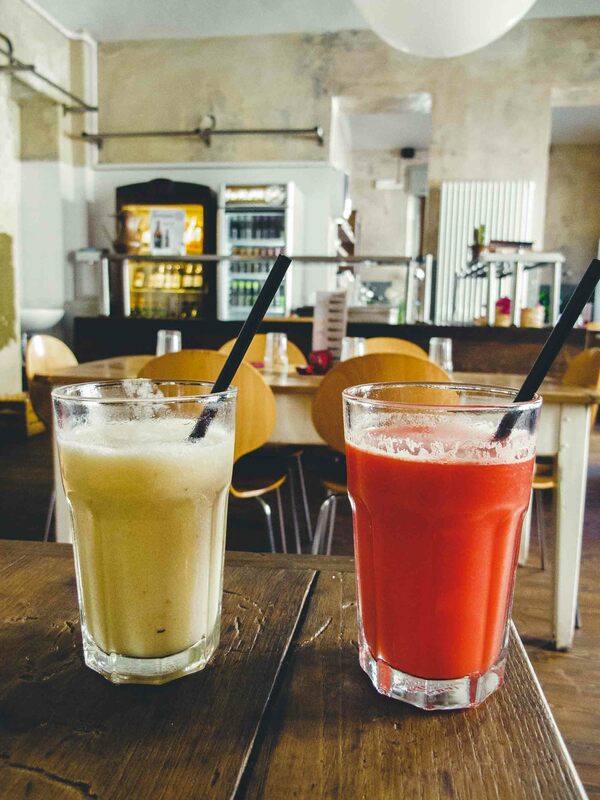 I had watermelon, lemon and ginger ‘estratto del giorno’ and Doni had banana and melon ‘fruttato del giorno’. Each were €4 for a small. Most people who ordered the large drinks were sharing, this represented a good value but we wanted to try a variety of drinks and €4 was still a good value for the quality of the drink. Options seemed a bit limited for our meals since we didn’t really want fried rice, pasta, salad, wraps or raw zucchini pasta so I had the seitan (straccetti di seitan, €10) and Doni had the burger (chicken-style, €6.50). The dessert wasn’t on the menu, but the waitress spoke English and described three options: chocolate cake with passion fruit, chocolate cake with berries, or a pastry basket. All were €5, but since I really wanted something beyond chocolate, we decided against ordering dessert. The seitan was pretty delicate, and I appreciated that the texture wasn’t tough or rubbery at all. Along with smoked bell peppers, olives and what was essentially a brown gravy, this dish would have been a perfect breakfast if served up with a biscuit. The seitan was paired with a side of home fries (salt distribution was uneven on the potatoes so some were under-seasoned and others were overwhelmingly salty). Since there were no other seasonings on the potatoes, no herbs or spices, we went ahead and added some ketchup. The condiments are placed by the wall and you will see people going over to the condiment table with their plates to season or garnish their dishes. The chicken patty in the chicken-style burger had a nice texture and crust on it, but the buns were too bready and dry. The burger was served with fries, and they were the larger steak cut fries. We preferred the fries over the roasted potatoes. While the protein and fries with the burger hit the spot, we found the sandwiches at Universo Vegano to be slightly better overall. The food was not bland but the flavors weren’t exactly challenging or new. These were familiar and fairly common flavors but overall the food was well prepared, the proteins had nice texture and the juices were lovely and fresh. Portion sizes were sufficient, perhaps even quite generous given the lunch time pricing. The most popular dish, during our lunch service appeared to be the wraps. The waitress spoke English pretty well (and also spoke French), well enough to explain the dishes and translate ingredients we weren’t familiar with. 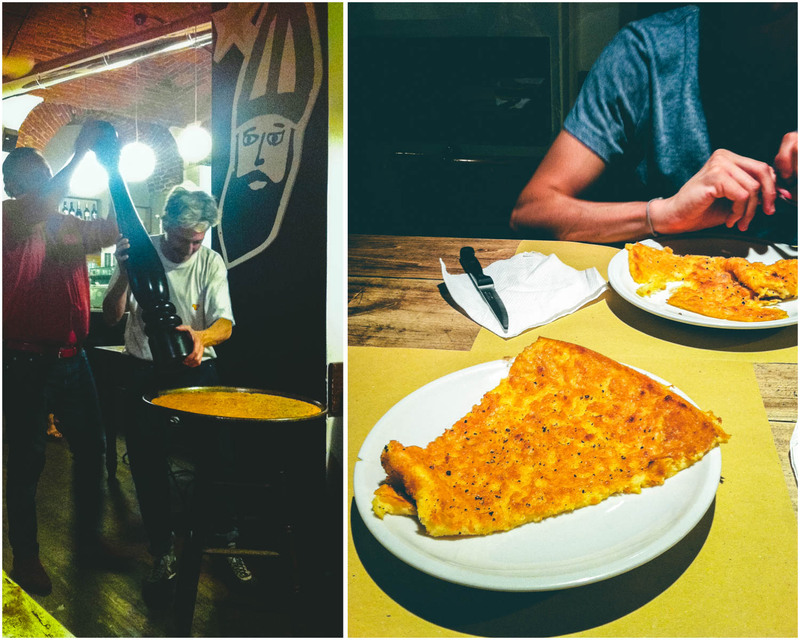 We passed up or missed out on a lot of farinata during our trip. Some, like one particularly famous location in Genoa, were closed for the summer holidays. Others weren’t made with the traditional wood fired oven, so we kept searching for the right one. When we finally got around to trying farinata, things couldn’t have aligned any better for us. The man behind the counter, prepping and cooking up the farinata had a passion and energy for each farinata he fired that made every visit enjoyable. Farinata is especially good when it’s served up hot, and always worth waiting for a fresh, hot slice rather than one that’s been sitting out for a while. 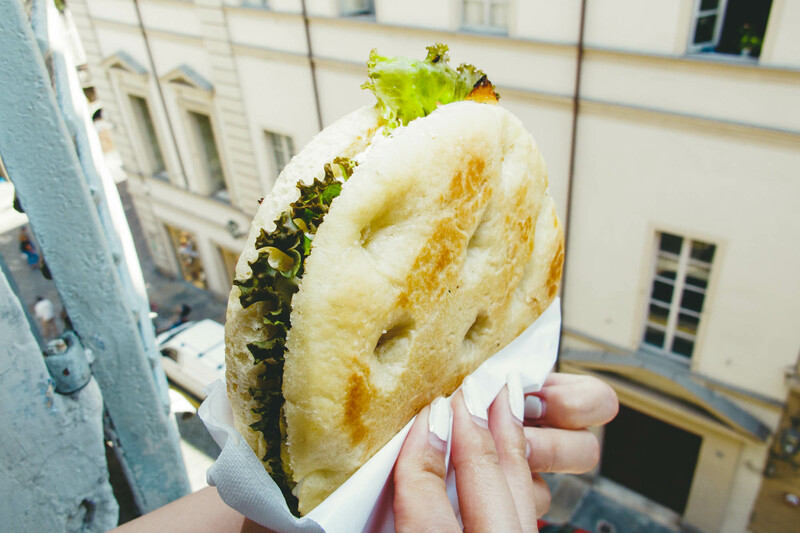 Based in Turin, Focacceria Sant’Agostino has two sister locations in the city but this location appeared to be the most traditional. Another location in the center is on Via Lagrange near Eataly – this location appeared to be more dedicated to focaccia. 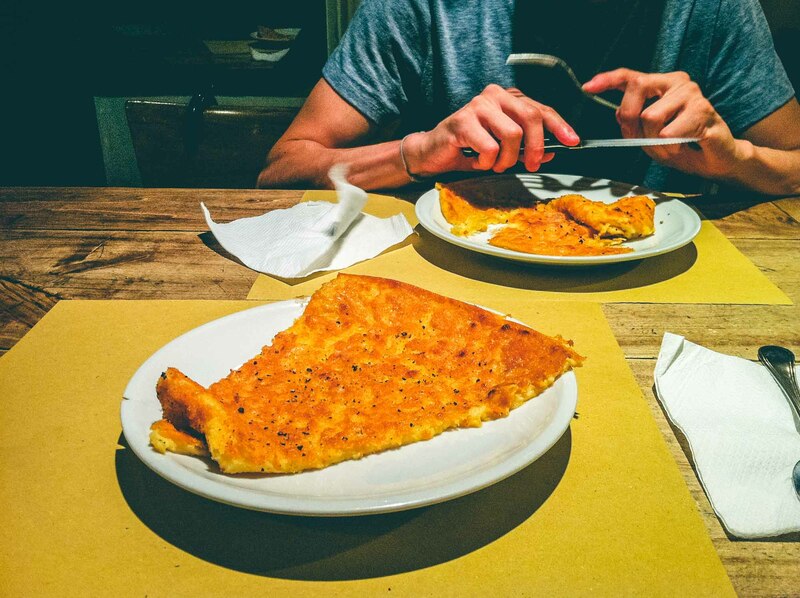 Farinata at Focacceria Sant’Agostina on Via Sant’Agostino was €3.50 per slice. I highly recommend trying their farinata since it is a popular vegan-friendly and traditional option at this place. It’s creamy, crunchy and irresistibly delicious. The staff will sprinkle freshly ground pepper on your farinata upon request (and we recommend it). We went there several times in the evening and thoroughly enjoyed sitting and watching people over a hot slice of Farinata. I recommend going in the evening when it’s busy enough to have farinata constantly coming out of the oven, one after a another. 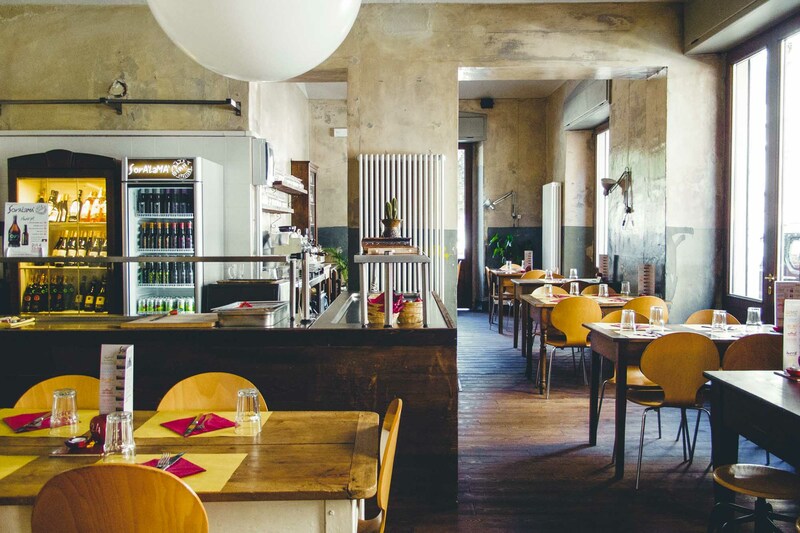 Osteria La Capannina is a typical local restaurant in Turin. Located in a nice neighborhood, not too far from the train station on a quiet side street and with ample indoor and outdoor seating. This is a popular lunch place for locals, with a good turnover of tables often ordering one of the daily lunch menus. 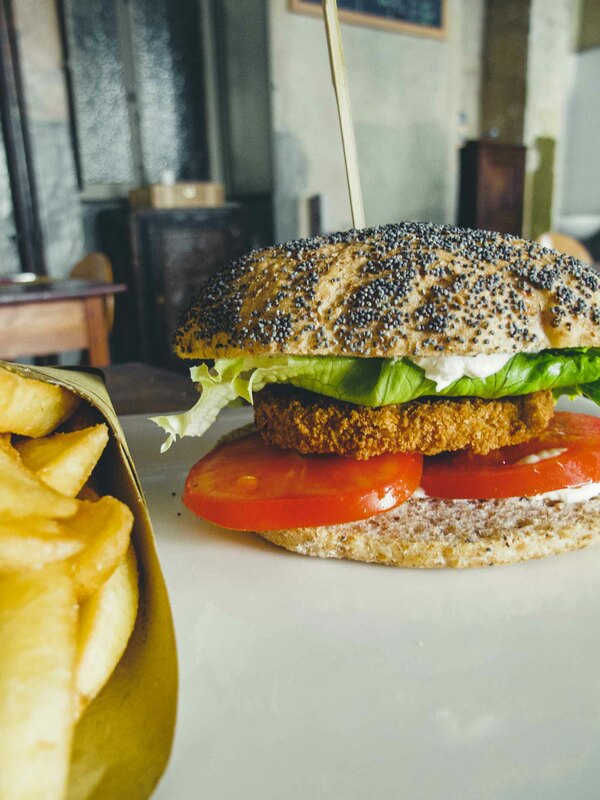 While not 100% vegan, this establishment offers vegetarian, vegan and even gluten-free options and the menu clearly denotes which items are vegan friendly. 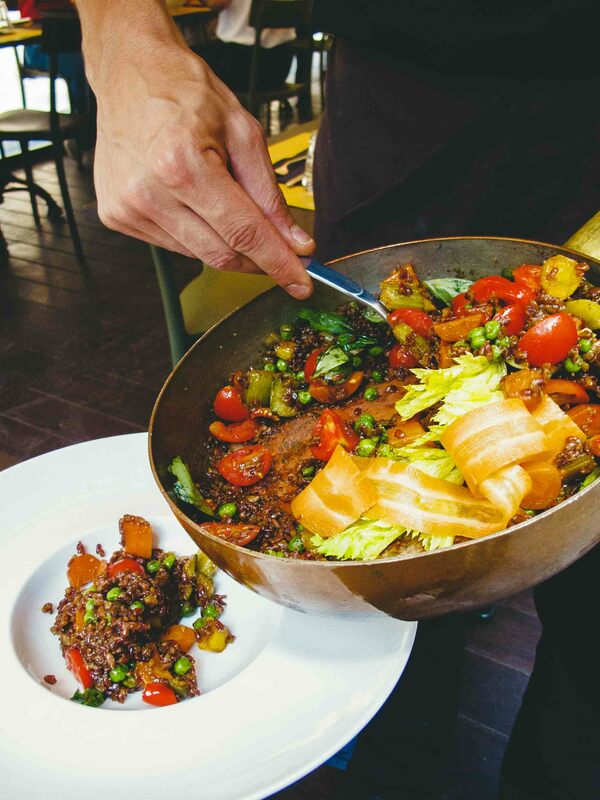 We contacted them in advance to make a reservation, while also noting that we are vegan, but upon arrival discovered neither was necessary since the restaurant has so many tables and such clear labeling of vegan options. Service was super friendly, professional and quick. The total for our meal came to €33.50 ($45). Integral rice, quinoa, fresh peas and seasonal vegetables brunoise. Additional vegetables were celery, zucchini, cherry tomatoes and carrots. Served from the pan at table and garnished with celery and carrot. Hearty portion and a lovely main. The rice was nice and firm and this dish overall had great texture and flavor. Tofu, seitan and zucchini cooked to typical Piedmont preservation technique (breaded and pickled). It was a cold starter consisting of two breaded and pickled steaks, one seitan and one tofu with cherry tomatoes, pickled zucchini,carrot & cabbage. Served with a red wine reduction. Cold and tart with nice acid from the pickling. Prickly lettuce, sun-dried tomatoes, pine nuts, olives, garlic and oil. With escarole, large delicious sun-dried tomato pieces, garlic cloves, nice little pitted black olives similar to Nicoise olive, toasted pine nuts, a bit of oil and a perfectly prepared dough that resulted in an airy crust that was crunchy without being dry and soft without being chewy. Drizzling additional olive oil over the top perfected this pizza. 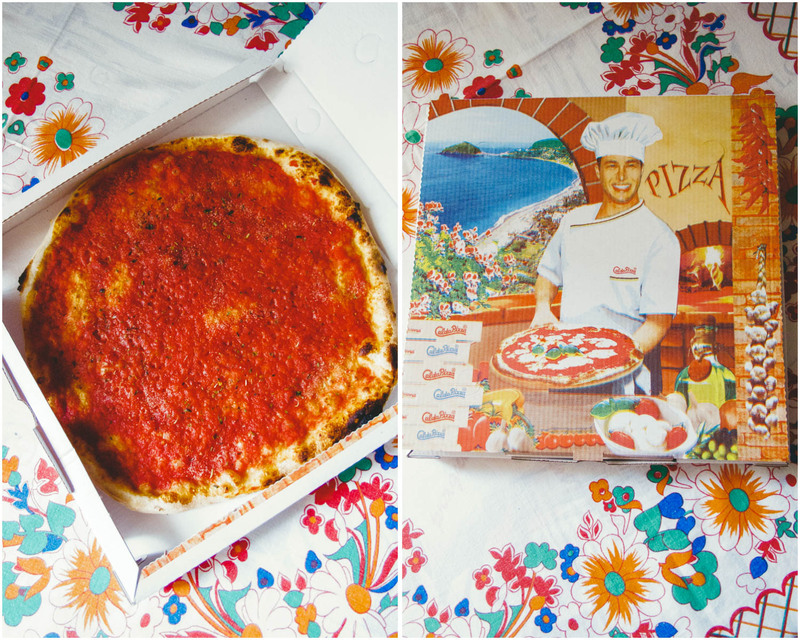 This was a nice, fresh turn from traditional red sauce pizzas. We also had a 75cl bottle of filtered sparkling water (€1.50) and followed our meal with two espressos (€1.50 each). 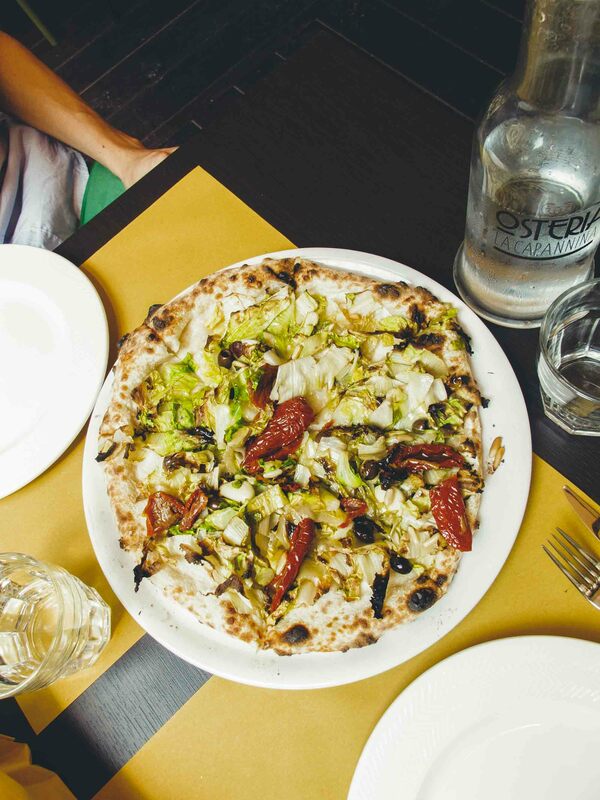 Dining at Osteria La Capannina was a thoroughly local experience. Located away from the tourist points in the city, there is very much a neighborhood vibe to the atmosphere and clientele. The delightful flavors of the food were accentuated by the exceptional service and pleasant local atmosphere. I cannot express just how much we enjoyed this experience and how full heartedly we recommend visiting Osteria La Capannina when you are in Turin. Osteria La Capannina is also open for dinner but we only dined here for lunch. 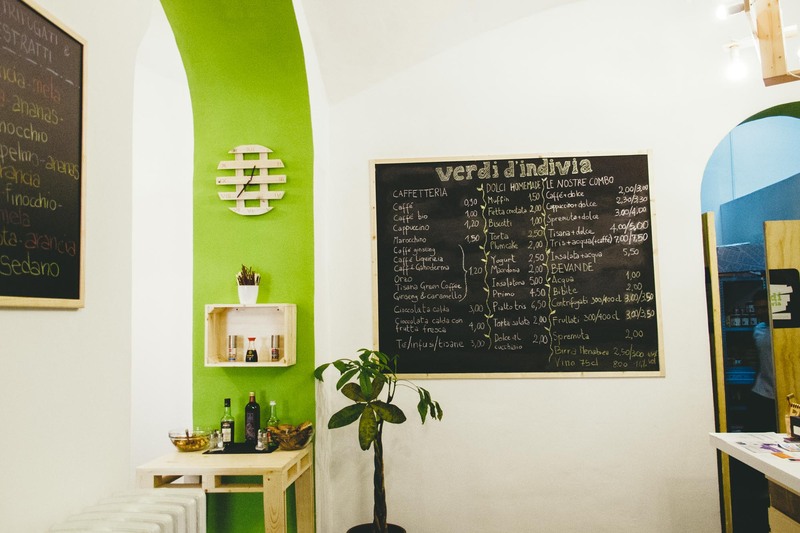 A cute retro pizzeria place in between Universo Vegano and Verdi D’Indivia (and on the same street as both). 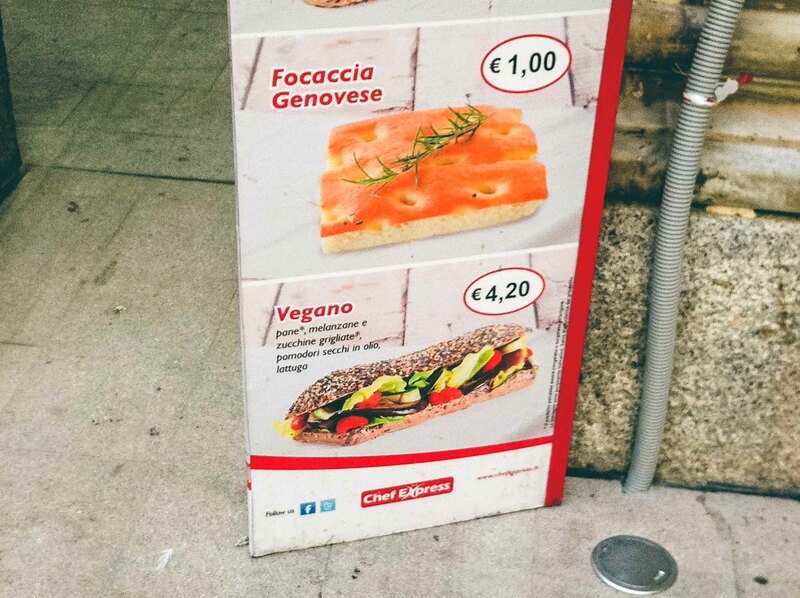 They don’t have many vegan options, but their vegan-friendly marinara pizza, at just €3, was great, simple, snack with tomato, oregano and olive oil. 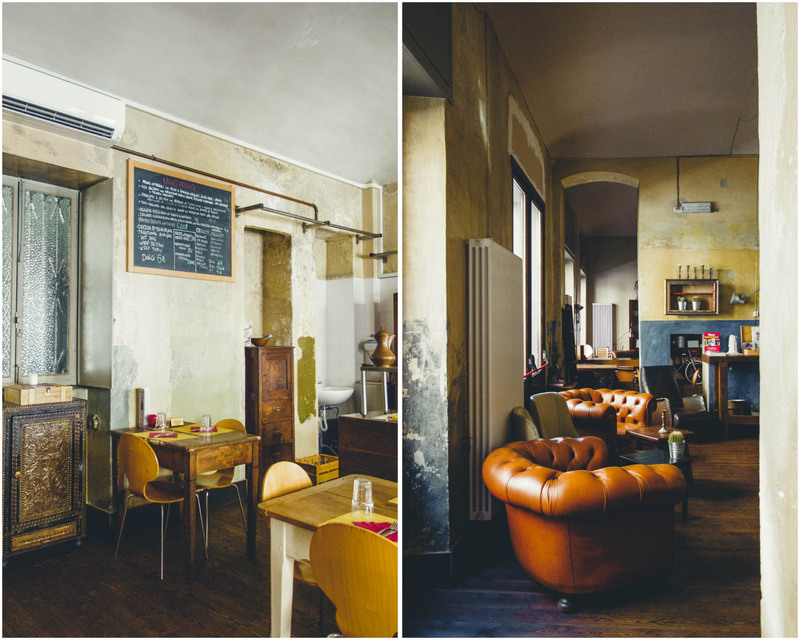 You will see the cafe at train stations in Italy very often. 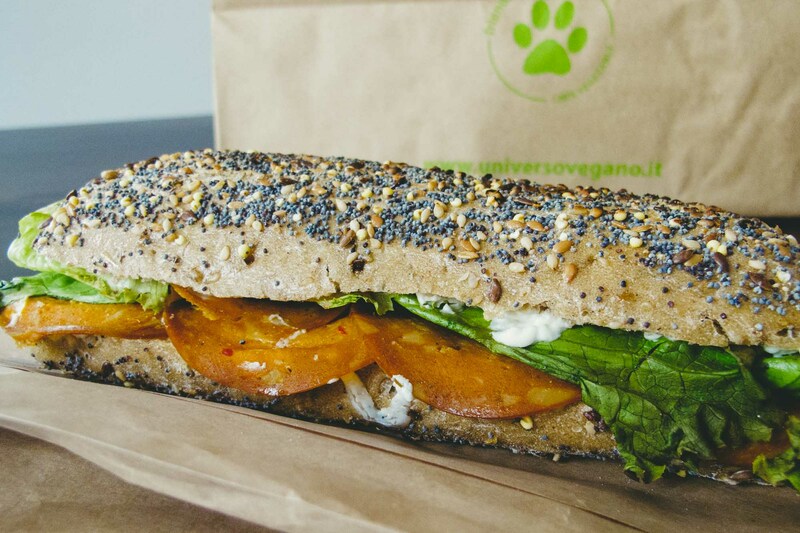 They carry a vegan sandwich with roasted veggies and seeded bread, looks like a convenient snack on the go! 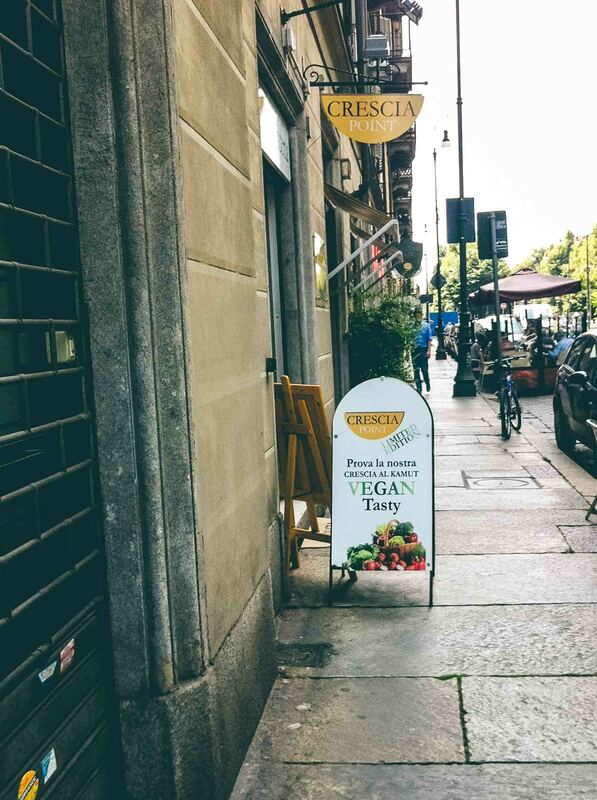 We were walking to a grocery to pick up some food and saw a huge sign nearby that wrote “VEGAN CRESCIA WRAP.” Crescia is an Italian version of a tortilla or flatbread, but grilled. We were tempted to try it, but later forgot all about it. That might be something worth trying! 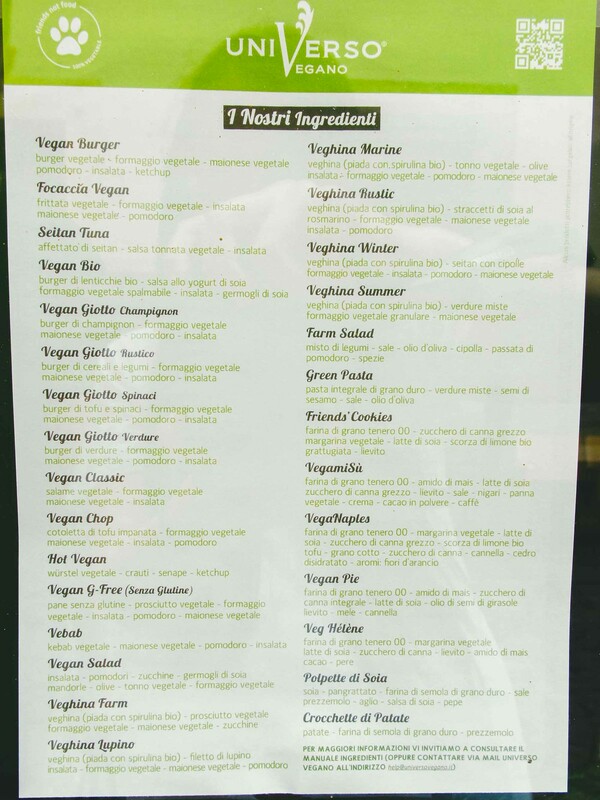 Close to Royal Palace of Turin (Palazzo Reale di Torino) Spotted vegan options written on their massive window display. It’s not 100% vegan, but they have a vegan section on their menu, which changes regularly. 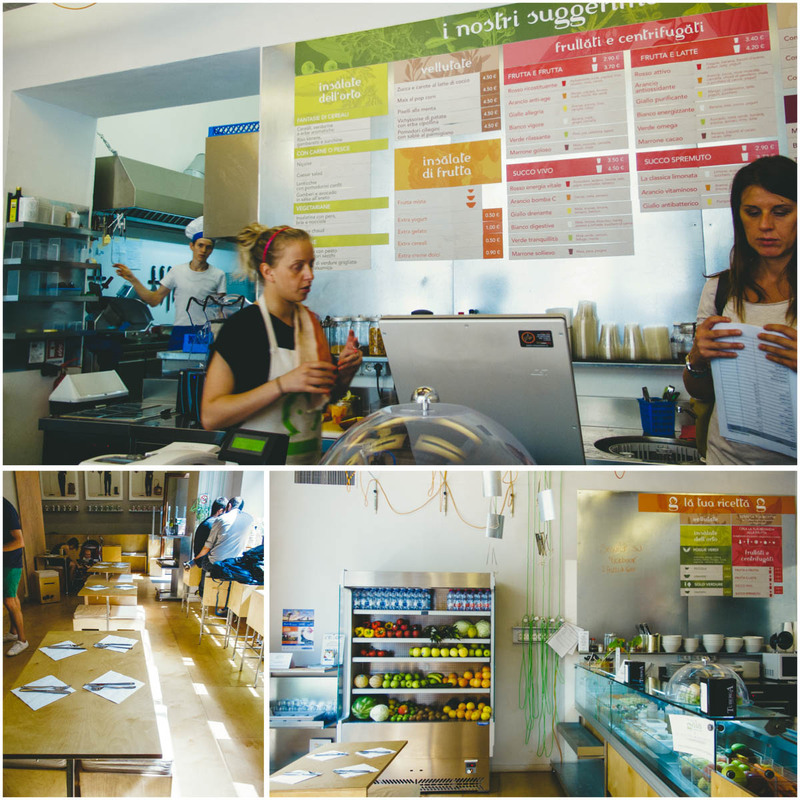 Cute cafe (not 100% vegan) offering fresh and natural smoothies, juices, salads, desserts, pies and sandwiches. We wanted to try their ‘White Digestive’ juice (apple, lemon, fennel, mint, ginger and brown sugar), but they didn’t have fennel. Interesting juice selection, some contain honey and dairy though. See photo of cafe and the interiors here. 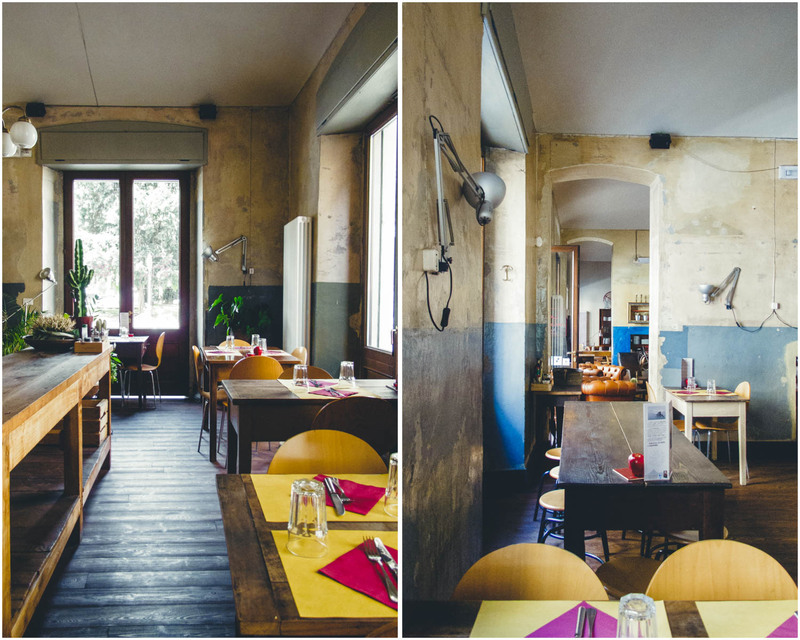 This laid back vegan-friendly bistro with outdoor seating was just around the corner from our flat at the corner of Via Barbaroux, but we never got around to trying it. Dog-friendly. Close to the center and 50m off of via Garibaldi. 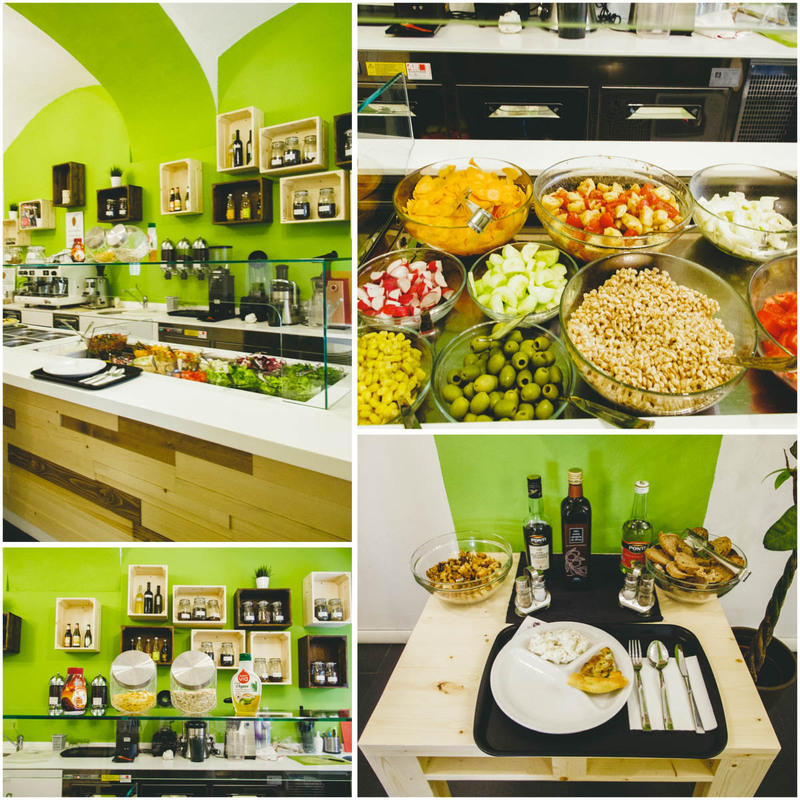 It’s a self-service place where you can pick up fresh salads, soups, fruits, cakes, etc. Available to go as well. Update (April 2017): This shop has closed. One of the better vegan-friendly and health food shops located in the center was one that we randomly stopped by during a stroll. It was about a 6 minute walk from our flat. 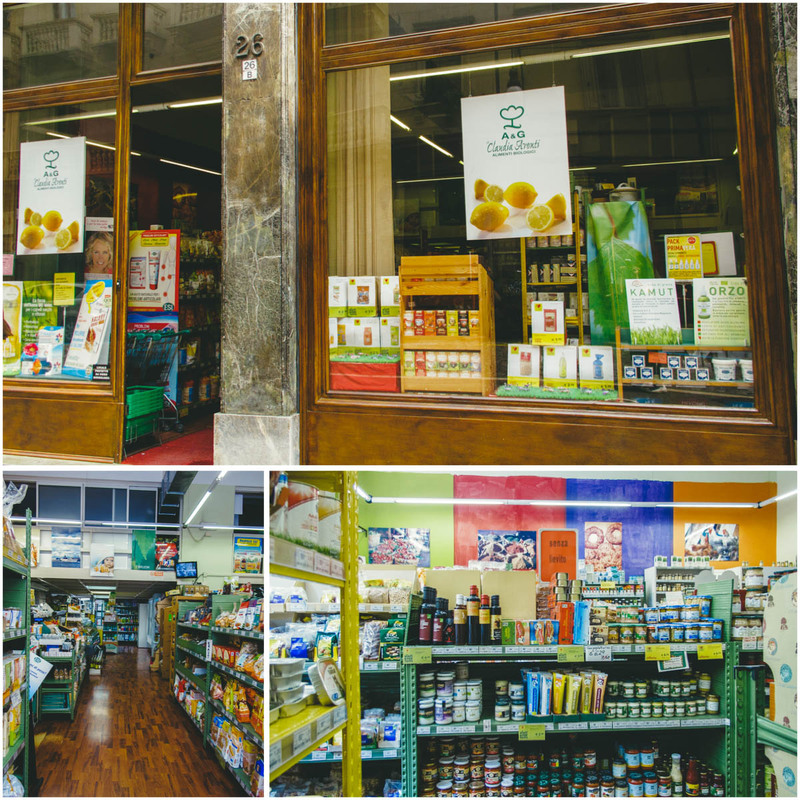 They carry more vegan and soya products than Mezzaluna Bio, including vegan ravioli! Open Monday 1 – 7:30pm, Tues – Sat 10 – 7:30pm. See photo of storefront and interiors here. We went to the nearest one in the center, and it’s the smaller location of the two shops in Turin. The larger, and original Eataly where it all began, is located in the Lingotto district and is a short bus, train or bicycle ride from the center. Eataly, while often a bit overpriced, can be a convenient stop for high quality staples like pasta, wines, and various basics. Eataly is especially handy since they have longer opening hours, and is one of the few shops open on Sundays. 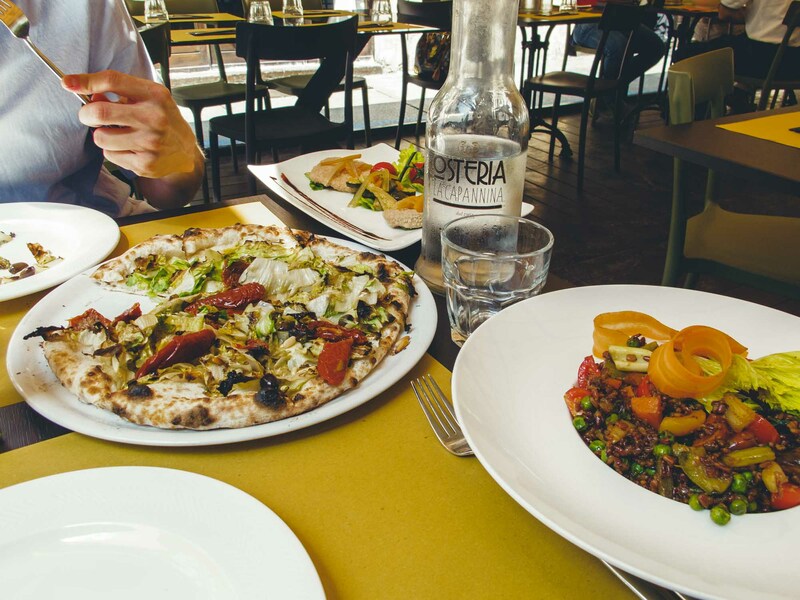 The inner-city (Lagrange) location rarely has vegan options on their restaurant menu, while the larger Eataly in Lingotto has vegan dining options more often but still infrequently. Organic vegetarian grocery with a small vegan restaurant featuring a deli style selection of daily dishes. Some grocery products and meat alternatives contain eggs and dairy so be sure to read the labels. No luck on vegan cheese products compared to Un Monde Vegan in Paris, but they have vegan nutella, handy vegan cooking creams and high quality vegetable broth/bouillon. Have you been to Turin or Italy? 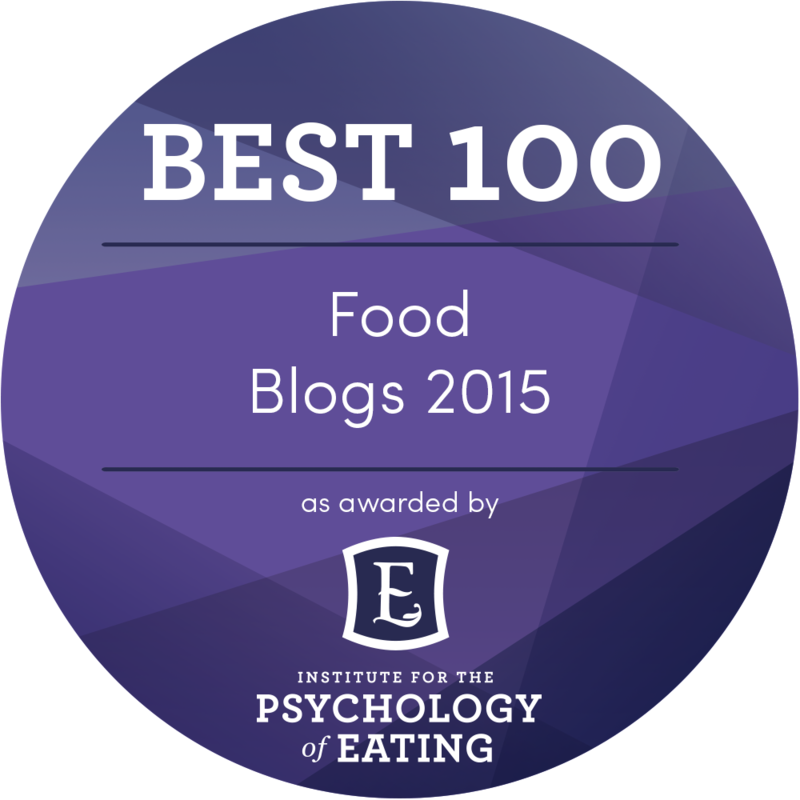 What was your experience like with the vegan/vegetarian options?